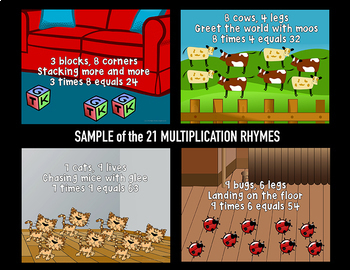 These fun rhymes and chants will improve multiplication fluency for the 21 hardest facts using colorful posters and a video, task cards, student study cards, bingo, and teacher notes. These tools will make memorizing the times tables much easier and students LOVE them! Have you tried EVERYTHING to get your students to memorize their multiplication tables? I did, too. My most successful method was starting with what most 3rd graders already knew (counting by 2, 5, and 10), then showing them how skip counting was actually multiplication. Next, explaining the commutative property for multiplication. Then, teaching the times table rules for 0 and 1. Once this is done, you can color in a chart (included in this resource) to show students that there are only 21 facts left to learn! 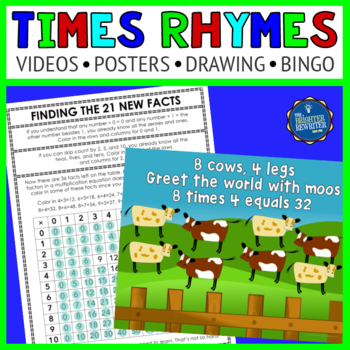 I've created rhymes and visuals for each one of these 21 new facts...different from other similar products I've seen because the visuals actually illustrate the equations. 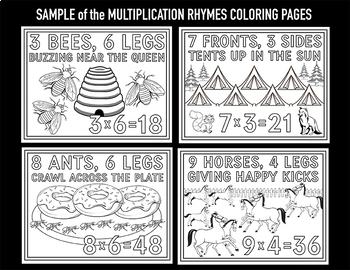 The multiplication charts show the known facts and the new facts, plus there is one blank multiplication chart that you can color in to "surprise" your students. Once all the known facts in each row and column are colored in, the students will be ecstatic to see that there are only 21 multiplication facts left to learn! Please watch the video preview to see and hear a portion of Times Rhymes. The student study cards can be placed in envelopes or put on rings. You can alternate the sequence of the task cards and use them over and over again. 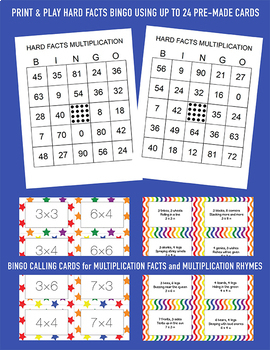 The students can either write the bingo game numbers on the blank card, or cut-and-glue numbers to create their own unique bingo cards. Save these student cards and play bingo as many times as needed for effective, fun practice. The posters and task cards are saved at 300 dpi and designed to be printed on 8.5x11 paper. They can be printed in black-and-white, although I do recommend color. Laminate them and your investment will last a long time.